Like Chia seeds, I add Flax seeds to almost everything. Flax seeds have a lot of nutritional benefits that should be added to your diet. I get the seeds and then grid them up. This brings them back to life and makes them easier to digest in your system. I add flax seed to my smoothies, oatmeal, salads and when I bake. Here are 10 reasons to add flax seed to your diet. 1.The consumption of flax seed is associated with a reduction in total cholesterol, including the LDL (bad) cholesterol and triglycerides. Study after study has shown a positive response to eating ground flax seed daily. Eating low fat foods, increasing your exercise, limiting the salt, sugar and eating flax seed daily are a few ways that you can win the battle against high cholesterol. 2.Nutritionists are instructing their diabetic patients to eat flax seed daily. It has been discovered that the omega-3 fat and high fiber in flax may play a role in the fight against diabetes. In a study conducted by the University of Toronto, participants who ate flaxseed bread had blood sugar levels 28% lower an hour after eating than their counterparts who ate bread made with wheat flour! 3.Flaxseed is high in lignans, up to 800 times the amount as in any tested plant food. Lignans (a phytoestrogen) have been called by H. Adlercreutz (in his article ) Phytoestrogens: Epidemiology and a Possible Role in Cancer Protection ), natural cancer-protective compounds. Flax seed is also high in alpha linolenic acid (ALA) which has been found to be promising as a cancer fighting agent. The American National Cancer Institute has singled out flax seed as one of six foods that deserve special study. 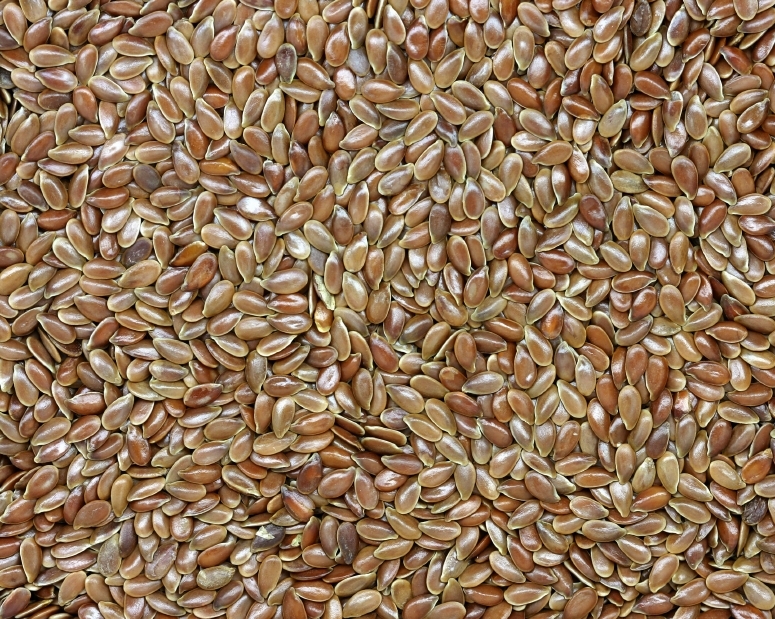 Flax seed’s high fiber aspect is also beneficial in the fight against colon cancer. Epidemiological studies note that diet plays a major role in the incidence of colon cancer. Research has shown that increasing the amount of fiber in your diet reduces your colon-cancer risk. Flax seed, high in fiber, lignans, alpha linolenic acid, is a key player in the fight against cancer, particularly breast and colon cancer. 4. Flax is high in both soluble and insoluble fiber. One ounce of flax provides 32% of the USDA’s reference daily intake of fiber. Flax promotes regular bowel movements because it is high in insoluble fiber. Flaxseed’s all natural fiber helps to absorb water, thereby softening the stool and allowing it to pass through the colon quickly. When adding fiber to your diet, it is important to make sure that you are drinking at least eight glasses of water daily. Without enough liquids, fiber can actually cause constipation! In the fight against constipation exercise, eat fruits and vegetables, drink eight glasses of water daily and add two to four tablespoons of flax to your daily regime! 5. Flax is high in Omega 3 essential fatty acids. That’s good news for people who suffer from inflammatory disorders, including rheumatoid arthritis. Health experts, such as former Surgeon General C. Evertt Koop, recommend eating foods high in Omega 3’s for people suffering from rheumatoid arthritis. It is the inflammation within the joints that cause so much of the pain associated with arthritis. The January 1996 issue of the American Journal of Clinical Nutrition reported that the participants in a study that took flax oil daily reduced inflammatory responses by as much as 30%. 6. Hot flashes, night sweats, irritability, moodiness, the joys of menopause. Can flax really help? Yes it can! Flax, like soy, is a phytoestrogen. Phytoestrogens are estrogen-like substances that are found in plants. Flax is the richest known plant source of phytoestrogens. Phytoestrogens act as a natural hormone therapy and help to stabilize hormonal levels. This stabilization of hormonal levels helps to lesson the symptoms of menopause. 7. Heart disease, the number one killer in America, has claimed the lives of too many of our family and friends. Years of a sedentary lifestyle, super size meals and processed foods has finally caught up with us. Can flax help? Yes it can. Numerous studies have been done on the effect of flax on heart disease, yielding many positive findings. Flax has been found to help reduce total cholesterol, LDL levels (the bad cholesterol), triglycerides. Flax helps to reduce clotting time and thereby reduces the chance for heart attacks and strokes. Regular intake of flax protects against arrhythmias and helps keep the arteries clear and pliable! 8. Across the table, your co-worker sneezes, no tissue in sight, you feel a light spray hit your face and shudder. Standing in a crowded elevator, in a busy mall, or in an airplane, you sometimes feel like you can’t escape getting at least one or two cold’s each year. Research has found that eating flax daily favorably affects immunity, the body’s ability to defend itself successfully against bacteria and viruses. Two components of flax, lignans and ALA (alpha-linolenic acid), have been found to affect immune cells and compounds that control immune reaction. 9. It’s that tired feeling that a good night’s rest won’t shake that listless down in the dumps feeling that you just can’t get rid of, otherwise known as atypical depression, the most common form of depression. Preliminary research suggests that eating a diet rich in flax could slash your risk of ever feeling down in the dumps. Follow up studies show that just 2-3 tablespoons of flax daily can help up to 2/3rds of severely depressed women bounce back within eight weeks. Flax, says Udo Erasmus, PhD, has a mood boosting ingredient: docosahexaenoic acid (DHA) that is essential for the proper function of brain cells, yet up to 85% of women aren’t getting enough of it. Early research conducted by Dr. Martha Clare Morris of Chicago’s Rush-Presbyterian-St. Luke’s Medical Center notes that a diet rich in omega-3 fatty acids is believed to be important for brain development. She stated that some participants in the study saw a decreased risk of Alzheimer’s from eating a diet high in omega-3 fatty acids (Flax is the richest source of Omega 3’s in the plant kingdom). More research is needed in the area of flax and its relation to depression and brain function, however preliminary research is very promising. 10. Flaxseeds contain 40% oil, most of which are the crucial omega-3 essential fatty acids (EFAs) that our bodies are so desperate for. The combination of EFAs and fiber in flax helps to promote normal cholesterol levels.